Opening reception on the first day of the exhibition at 19:00, unless otherwise advertised. The collaboration of Photography students and Sushibar+Wine City continues after a successful kick-off year full of fantastic exhibitions. We are hereby announcing an open call for exhibitions in 2019. This is a collaborative project solely managed by students themselves, for the sake of promoting and showcasing our artistic work. 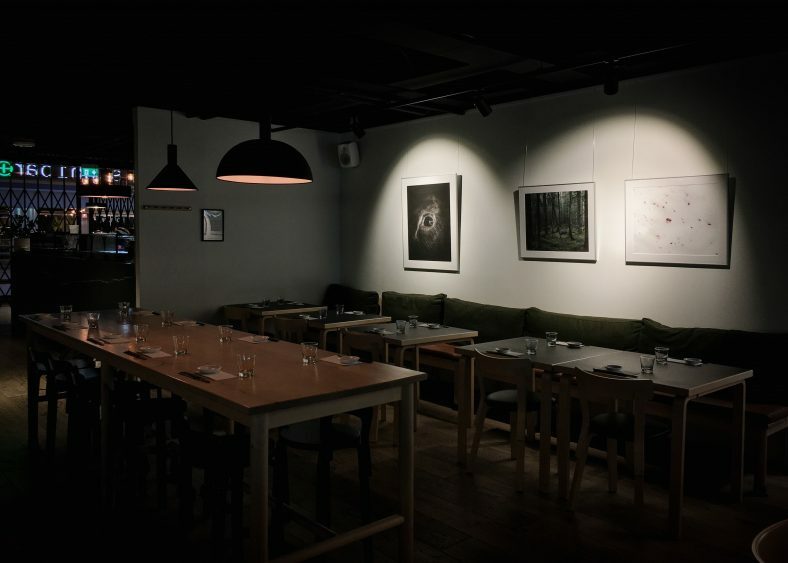 Sushibar+Wine City has a wall reserved for photography exhibitions from Aalto University Photography students and alumni. The restaurant is located on a central spot, on the second floor of Citycenter Helsinki. 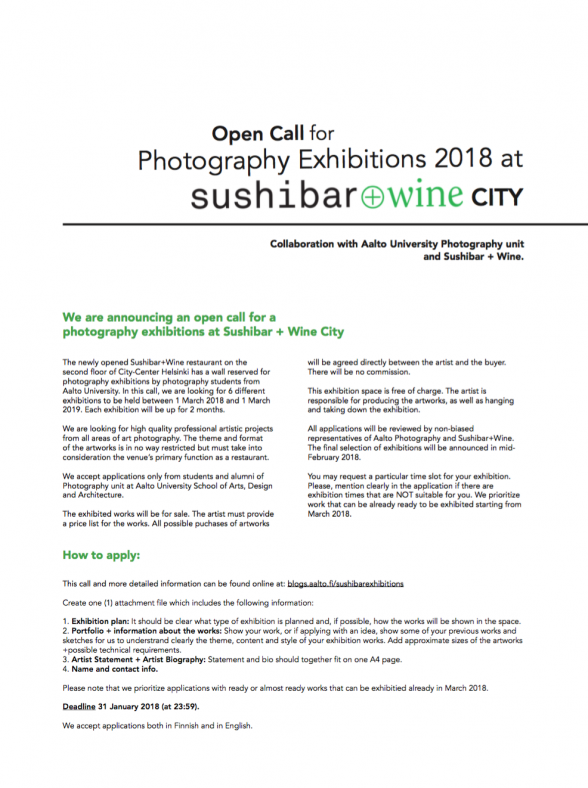 In this call, we are looking for 6 different exhibitions to be held in Sushibar+Wine City between January–December 2019. Each exhibition will be up for approximately 2 calendar months. We are looking for high quality professional artistic projects from all areas of art photography. The theme and format of the artworks is not restricted but must take into consideration the venue’s primary function as a restaurant. All applications will be reviewed by non-biased representatives of Aalto Photography students and Sushibar+Wine. The final selection of exhibitions will be announced early December 2018. This exhibition space is free of charge. The artist is responsible for producing the artworks, as well as hanging and taking down the exhibition. The exhibited works will be for sale. The artist must provide a price list for the works. All possible purchases of artworks will be agreed directly between the artist and the buyer. You may request a particular time slot for your exhibition but getting the requested exhibition time is not guaranteed. Please, mention clearly in the application if there are exhibition times that are NOT suitable for you. We prioritise work that can be ready to be exhibited already in January 2019. The exact starting and closing dates for the exhibitions will be determined alongside with the exhibition decisions, and the selected applicants will be informed of these dates together with the notification of their acceptance. We accept applications from students and alumni of Photography unit at Aalto University School of Arts, Design and Architecture only. Please note that you can be already graduated. 1. Exhibition plan: It should be clear what type of exhibition is planned and, if possible, how the works will be shown in the space. 2. Portfolio + information about the works: Show your work, or if applying with an idea, show some of your previous works and sketches for us to understand clearly the theme, content and style of your exhibition works. Add approximate sizes of the artworks, and possible technical requirements. 3. Artist Statement + Artist Biography: Statement and bio should together fit on one A4 page. 4. Name and contact info. Please note that we prioritize applications with ready or almost ready works that can be exhibitied already in January 2019. Deadline 16 November 2018 Saturday 1 December 2018 (at 23:59). We accept applications both in Finnish and in English. Yhteistyö Aalto-yliopiston valokuvataiteen opiskelijoiden ja Sushibar+Wine Cityn kanssa jatkuu onnistuneen ensimmäisen näyttelyvuoden myötä. Haku näyttelyihin Sushibar+Wine Cityssä vuodelle 2019 on nyt auki. Tämä on yksinomaan valokuvataiteen opiskelijoiden fasilitoima projekti, jonka tarkoitus on tarjota mahdollisuus esittää ja promota taiteellista osaamistamme. Sushibar+Wine City tarjoaa näyttelyseinän Aalto-yliopiston valokuvataiteen opiskelijoiden teoksien esittämiseen. Ravintola sijaitsee keskeisellä paikalla Helsingin Citycenterin 2. kerroksessa. Tässä haussa valitaan kuusi (6) eri näyttelyä aikavälille tammikuu–joulukuu 2019. Yhden näyttelyn kesto on noin kaksi kalenterikuukautta. Haemme korkeatasoisia ja ammattimaisia näyttelykokonaisuuksia kaikilta valokuvataiteen osa-alueilta. Teosten teema ja muoto ovat vapaat, mutta niiden tulee huomioida näyttelytilan ensisijainen käyttötarkoitus ravintolana. Hakemukset arvioi puolueettomat Aalto-yliopiston valokuvataiteen opiskelijoiden ja Sushibar+Winen edustajat. Valinnat näyttelyistä ilmoitetaan hyväksytyille joulukuun alkupäivinä 2018. Näyttelytila on maksuton. Taiteilija on vastuussa teosten tuotannosta, näyttelyn pystytyksestä sekä purkamisesta. Näyttely Sushibar+Winessä on myyntinäyttely. Taiteilijan tulee toimittaa teoksistaan hintalista. Kaikki mahdolliset teosmyynnit sovitaan suoraan taiteilijan ja ostajan kesken. Ravintola ei osallistu teosmyyntiin eikä velota myyntipalkkiota. Näyttelyaikoja on tarjolla kuusi kappaletta. Voit hakemuksessasi esittää toiveen sinulle mieluisesta näyttelyajankohdasta. Valitettavasti emme voi taata, että saat juuri tämän ajan. Kirjaa hakemukseen selkeästi, mikäli joku näyttelyaika ehdottomasti EI SOVI sinulle. Hakemusmenettelyssä etusijalla ovat näyttelykokonaisuudet, jotka voidaan esittää Sushibarissa tammikuusta 2019 alkaen. Näyttelyiden tarkat aloitus- ja lopetuspäivämäärät päätetään näyttelyvalintojen yhteydessä. Näistä päivistä tiedotetaan näyttelyyn valituille taiteilijoille valintapäätöksen yhteydessä. Tämä haku koskee ainoastaan Aalto-yliopiston Taiteiden ja suunnittelun korkeakoulun Valokuvataiteen yksikön opiskelijoita ja alumneja. Huomaathan, että voit olla jo opintosi päättänyt. 1. Näyttelysuunnitelma: Esittele suunnitelmassa selkeästi, minkä tyyppinen näyttely on kyseessä ja, mikäli mahdollista, miten teokset asettuvat tilassa. 2. Portfolio + teostiedot: Esittele työsi, jolla haet. Jos haet idealla, liitä portfolioon aiempia töitäsi ja luonnoksia tulevista näyttelytöistä, jotta hakemuksen vastaanottajan on helppo ymmärtää, mikä tulevan näyttelyn teema, sisältö ja tyyli on. Liitä mukaan teosten koot (tai suunnitellut koot) + mahdolliset tekniset vaatimukset. 3. Artist Statement + Artist Biography: Statementin ja bion tulisi yhdessä mahtua yhdelle A4-arkille. Huomaathan, että hakemusmenettelyssä etusijalla ovat ne näyttelykokonaisuudet, jotka voidaan esittää Sushibar+Winessä tammikuusta 2019 alkaen. Deadline 16. marraskuuta 2018 lauantaina 1. joulukuuta 2018 (klo 23:59). Hyväksymme hakemuksia sekä suomen että englannin kielellä. Would you like to manage this project next year? The newest exhibition in Sushibar+Wine City will open on Thursday 1.11.2018. Artist: Veera Konsti. Opening reception at 19:00–20:00. This is a lovely chance to also familiarise yourself with the exhibition wall and the space. Welcome! 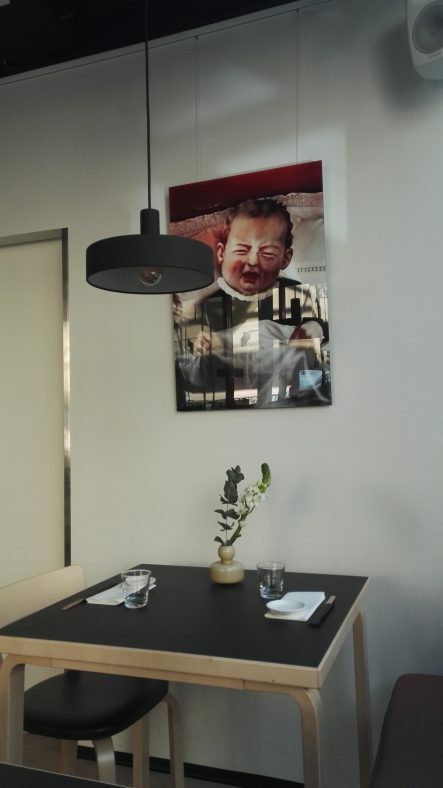 The newly opened Sushibar+Wine restaurant on the second floor of Citycenter Helsinki has a wall reserved for photography exhibitions of Aalto University photography students. In this call, we are looking for 6 different exhibitions to be held between 1 March 2018 and 1 March 2019. Each exhibition will be up for 2 months. 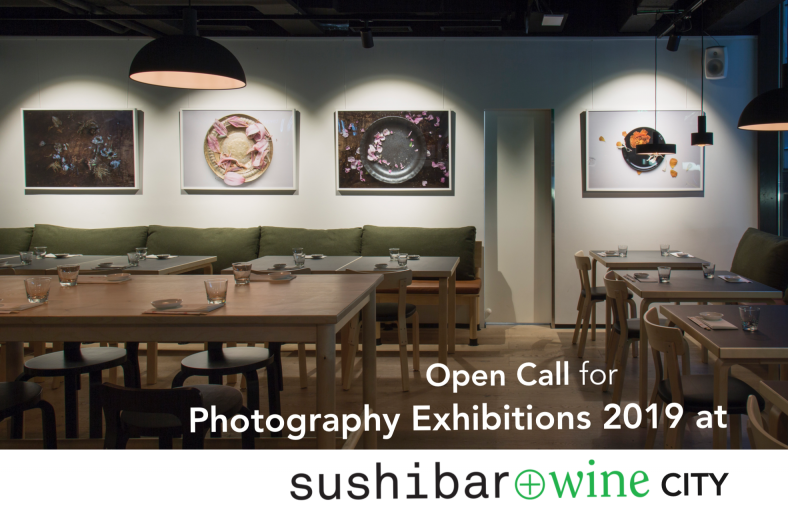 All applications will be reviewed by non-biased representatives of Aalto Photography and Sushibar+Wine. The final selection of exhibitions will be announced in mid-February 2018. The exhibited works will be for sale. The artist must provide a price list for the works. All possible purchases of artworks will be agreed directly between the artist and the buyer. There will be no commission. You may request a particular time slot for your exhibition but we can not guarantee that you can get the requested exhibition time. Please, mention clearly in the application if there are exhibition times that are NOT suitable for you. We prioritize work that can be exhibited starting from March 2018. We accept applications from students and alumni of Photography unit at Aalto University School of Arts, Design and Architecture only. 2. Portfolio + information about the works: Show your work, or if applying with an idea, show some of your previous works and sketches for us to understrand clearly the theme, content and style of your exhibition works. Add approximate sizes of the artworks +possible technical requirements. Please note that we prioritize applications with ready or almost ready works that can be exhibitied already in March 2018. Deadline 31 January 2018 (at 23:59). The space: Sushibar+Wine City is located on the 2nd floor of Citycenter (Kaivokatu 8, Helsinki). Please, download a drawing of the exhibition wall from the bottom of this text. You may also visit the space to get an idea how the wall is situated. Hanging materials: Picture rail. Tape. 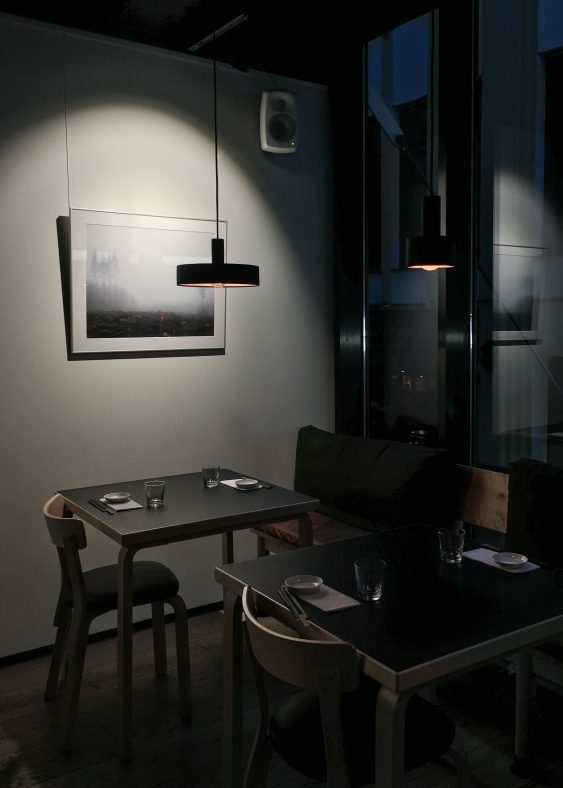 Lighting in the space: There are some regular spot lights available but note that all lighting should be planned so that it does not disturb the restaurant visitors. The exhibition wall faces large windows. Supervising the exhibitions: There is no supervision in the exhibition and the restaurant will not be in any way responsible for the artworks exhibited. The artist will exhibit on their own risk. Opening hours: The exhibition will be open during the opening hours of the restaurant. Fees: There are no fees related to this application or the exhibition space. Sales: The artworks will be for sale. The artist must provide a price list for the works. There is no commission. Advertising: The restaurant will advertise the exhibition and communicate its customers clearly that the artworks are for sale. Social media is used. The artist may use additional advertising. Hanging and taking down the exhibition: The artist is responsible for hanging and taking down the artworks. The hanging will be done in the morning of the exhibition opening day (usually Thursday) before the restaurant opens. This will also be the time when the previous exhibition is taken down. Opening: The artist may arrange a small opening gathering on the day of the opening. Sushibar&Wine provides some sparkling for the event. All invitations and advertising of the opening is done by the artist. Other materials: The artist must provide a short artist statement and bio with a photograph for the exhibition. Who can apply: We accept applications from students and alumni of Photography unit at Aalto University School of Arts, Design and Architecture only. Proof of affiliation is required. Uusi Sushibar+Wine -ravintola Helsingin CItycenterissä tarjoaa näyttelyseinän Aalto-yliopiston valokuvataiteen opiskelijoiden teoksien esittämiseen. Ensimmäinen haku näyttelyihin Sushibar+Winessä on nyt auki. Tässä haussa valitaan kuusi (6) eri näyttelyä ajalle 1. maaliskuuta 2018 – 1. maalikuuta 2019. Yhden näyttelyn kesto on kaksi kuukautta. Haemme korkeatasoisia ja ammattimaisia näyttelykokonaisuuksia kaikilta valokuvataiteen osa-alueilta. Teosten teema ja muoto ovat vapaat, mutta niiden tulee huomioida näyttelytilan ensisijainen käyttötarkoitus ravintolana. Hakemukset arvioi puolueettomat edustajat Aalto-yliopiston Valokuvataiteen ohjelmasta sekä Sushibar+Winestä. Valinnat näyttelyistä ilmoitetaan hyväksytyille helmikuun puolivälissä 2018. Näyttely Sushibar+Winessä on myyntinäyttely. Taiteilijan tulee toimittaa teoksistaan hintalista. Kaikki mahdolliset teosmyynnit sovitaan suoraan taiteilijan ja ostajan kesken. Ravintola ei osallistu teosmyyntiin eikä velota myyntipalkkiota. Näyttelyaikoja on tarjolla kuusi kappaletta. Voit hakemuksessasi esittää toiveen sinulle mieluisesta näyttelyajankohdasta, mutta emme takaa, että saat juuri tämän ajan. Kirjaa hakemukseen selkeästi, mikäli joku näyttelyaika ehdottomasti EI SOVI sinulle. Hakemusmenettelyssä etusijalla ovat näyttelykokonaisuudet, jotka voidaan esittää Sushibarissa maaliskuusta 2018 alkaen. Tämä haku koskee ainoastaan Aalto-yliopiston Taiteiden ja suunnittelun korkeakoulun Valokuvataiteen yksikön opiskelijoita ja alumneja. Huomaathan, että hakemusmenettelyssä etusijalla ovat ne näyttelykokonaisuudet, jotka voidaan esittää Sushibarissa maaliskuusta 2018 alkaen. Deadline 31. tammikuuta 2018 (klo 23:59). Tila: Sushibar+Wine City sijaiksee Citycenterin 2. kerroksessa (Kaivokatu 8, Helsinki). Voit ladata tämän tekstin lopusta piirroksen näyttelyseinästä. Voit myös vierailla ravintolassa tutustuaksesi tilaan. Tilan valaistus: Tilassa on muutama tavallinen spottivalo. Huomaa, että näyttelyn valaisu tulee suunnitella siten, ettei se häiritse ravintolan asiakkaita. Näyttelyseinää vastapäätä on isot ikkunat. Näyttelyiden valvonta: Näyttelyissä ei järjestetä erikseen valvontaa. Ravintola ei ole vastuussa näyttelyn taideteoksista. Taiteilija pitää näyttelyn omalla vastuullaan. Näyttelyn aukioloajat: Näyttely on avoinna ravintolan aukioloaikoina. Maksut: Tähän hakuun tai näyttelytilaan ei liity maksuja taiteilijalle. Teosmyynnit: Näyttelyn teokset ovat myynnissä. Taiteilijan tulee toimittaa teoksistaan hintalista. Ravintola ei osallistu teosmyyntiin eikä velota myyntipalkkiota. Mainonta: Ravintola mainostaa näyttelyä ja ilmoittaa asiakkailleen selkeästi, että kyseessä on myyntinäyttely. Sosiaalista mediaa käytetään hyödyksi mainonnassa. Taiteilijan on lisäksi mahdollista mainostaa omaa näyttelyään. Näyttelyn pystytys ja purku: Taiteilija on vastuussa näyttelyn pystytyksestä ja purkamisesta. Näyttely pystytetään ensimmäisen näyttelypäivän (yl. torstai) aamuna ennen ravintolan aukeamisaikaa. Samaan aikaan edeltävä näyttely puretaan. Avajaiset: Taiteilija voi järjestää avajaistilaisuuden näyttelyssä avajaispäivänä. Sushibar+Wine tarjoaa avajaisjuomaa. Mahdolliset kutsut ja avajaismainonta on taiteilijan vastuulla. Muut materiaalit: Taiteilijan on toimitettava lyhyt artist statement ja bio valokuvalla näyttelyä varten. Kuka voi hakea: Tähän hakuun voivat ottaa osaa ainoastaan Aalto-yliopiston Taiteiden ja suunnittelun korkeakoulun Valokuvataiteen yksikön opiskelijat ja alumnit. Affiliaatio on pystyttävä todistamaan.